The Trend airshield pro is designed to protect users from harmful dust particulates down to 0.3 micron size at a 98-Percent efficiency rate. A built in fan circulates the filtered air to prevent fogging and it provides some cooling. The nickel metal hydride battery allows for at least eight hours of operation on a full charge. The Trend airshield pro contains: airshield, one battery, airflow indicator, storage bag and clips for ear protection. Additional accessories are available. Keep your face safe from airborne debris and more with the Uvex Bionic face shield. Ideal for rugged jobs, and designed to be worn with safety goggles, the Uvex Bionic face shield features an extremely lightweight and balanced design for all-day comfort. It's well suited for workers who are exposed to falling or flying objects, impacts, chemical splashes, welding infrared radiation, or airborne debris. The headgear and visor are highly adjustable, allowing you to achieve a custom fit. 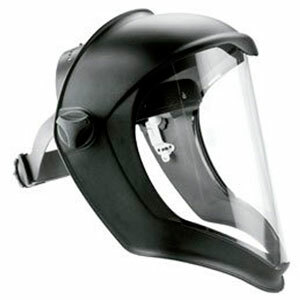 3M Tekk Protection, Professional Face Shield protects The Face From Flying Particles & Chemical Splash. Perfect for use when turning on a lathe to prevent large chips from hitting your face. Features an adjustable supsension for easy fitting for most any size. 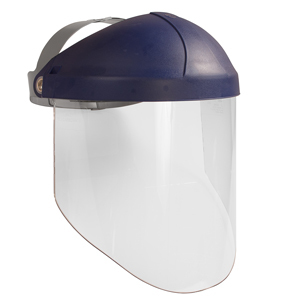 Clear polycarbonate face shield. Safety glasses should be worn underneath. Meets requirements ANSI Z87,1- 2009/CSA Z94,3-2005.